"This report makes it painfully clear that ministers have totally lost track of something as fundamental as how many people actually live in Britain. "The Government’s statistical incompetence has left councils floundering when they try to plan public services for local people. "Not only do internal and international migration estimates need to be improved as a matter of urgency, but the Government must also reintroduce exit checks immediately so that we know when people overstay their visas." Friends of Ian Sherwood will be pleased to know that his ten years service in the LibDem leader's office in Cowley Street, Westminster, has been marked with a presentation. 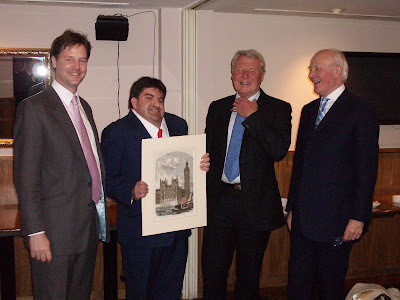 The picture shows him after receiving a print of Westminster, signed by three of the leaders he has served. Left to right are Nick Clegg, Ian, Paddy Ashdown and Sir Menzies Campbell. Evening Post reader John Owen complains that MP Peter Hain and council leader Derek Vaughan gloat unjustifiably over Labour's victory in the May 1st elections. We understand his feelings, and that of fellow Baglan residents. However, the way forward must be increased engagement with the political process, not more recriminations. We call upon the people of Baglan to actively support democratic political parties which more closely represent their views. We hope we can persuade them that Liberal Democrats, the party of fairness, of community and of sound local government, should be their choice. "Ministers have completely failed to understand the full consequences for police morale of their failure to respect the independent arbitration panel’s pay award. "It is understandable but regrettable that the police now want the right to strike, given the violation of the fair pay arrangements. "Even at this late hour I hope that the Government can deal with police grievances by paying the settlement in full." Vulture funds - as defined by the International Monetary Fund and UK Chancellor Gordon Brown among others - are companies which buy up the debt of poor nations cheaply when it is about to be written off, then sue for the full value of the debt plus interest. "Providing 1% of the cost of Nicaragua’s billion dollar commercial debt buy-back does nothing to excuse the Government from its total failure to tackle the scourge of vulture funds operating through British courts. "The £10m pledge to help prevent future activities by vulture funds pales in comparison with the hundreds of millions of pounds which British courts have awarded them so far. "The Prime Minister is keen to promote his commitment to global development, but an agreement on the need for an agreement is just not good enough. Where are the measures that will protect the world’s poorest from falling prey to vulture funds? "The least that this Government must do is to bring forward legislation to clean up Britain’s own financial regulations and ban vulture funds from using the UK as a base to exploit the developing world." "Ministers have taken leave of their senses if they think that this proposal is compatible with a free country and a free people. "Given their appalling track record of data loss, this Government simply cannot to be trusted with such private information." "Ministers should speed up processing rather than banging up claimants, and the obvious way is by setting up a Canadian-style independent agency to decide cases. "At present, a fifth of asylum appeals are successful because politics hampers the decision-making. "Another attempt to build a centre in Bicester that has already been mothballed once is unlikely to prove the magic bullet that this inhumane and ineffective policy needs." At their first monthly meeting after the May 1st elections, Neath and Port Talbot Liberal Democrats welcomed Joanne Foster, the new Chief Executive of Welsh Liberal Democrats. There were congratulations for John Warman (Cimla) and Keith Davies (Coedffranc North), who retained their seats, and for new councillors Des Sparkes (Cimla) and Frank Little (Cadoxton). It was felt that the strengthened Liberal Democrat group (now third-largest on the council) would increase its effectiveness out of proportion to the increase in its numbers. The meeting resolved to campaign on behalf of the people of Baglan, who had been denied a democratic choice at the election, after the last-minute defection of two Ratepayer candidates to the Labour party. It was reported that the ruling Labour group on Neath Port Talbot council had voted against offering chairs of any scrutiny committee to opposition councillors. In view of the fact that LibDem-led Swansea had proposed that the Labour opposition should have the choice of Swansea's scrutiny chairs, and a similar move in Ceredigion, Neath Port Talbot's obduracy was condemned as undemocratic. John can guarantee my support on this issue (writes Annette Sparkes of Tonmawr). I have done extensive research into the harm done by fluoride. The fluoride that is added to the water supply is a toxic waste of the fertiliser industry, and not the fluoride that’s found naturally in water. There is no end of information regarding the dangers from this poison, and for ANY government calling for fluoride to be introduced into our water supply, needs to be voted out of office. “If more than used for brushing is accidentally swallowed, get medical help or contact a Poison Control Centre right away." We are paying companies to put their hazardous waste into our drinking water, hence source water. Shouldn't these companies pay for the disposal of their own hazardous waste, in a manner that does not cause environmental or human health harm? The National Research Council has identified fluoride as an "endocrine disruptor" while recent research from Harvard University has found a connection between fluoride and bone cancer that is “remarkably robust”. And the list goes on. I hope (concludes Annette) that all those who read this will all give their full support to John, in his fight to keep our water pure. Gwenda Thomas, AM for Neath, in her capacity as Deputy Minister for Social Services, on Tuesday laid before the Assembly the LCO outlined last November. One of the local authorities she criticised by implication was her home council of Neath Port Talbot, which, as one of the measures aimed at keeping down council tax increases, hiked care charges this year. Government postponing bad news on tax credits? HM Revenue and Customs were scheduled to release Tax Credits 'Finalised Awards' and 'Supplements of Payments' for 2006-07 yesterday [Tuesday 20th May]. They should have been available here. LibDem analysts expect the statistics on tax credits overpayments to show that the Tax Credits system has wasted over £10bn in four years. The figures are expected to reveal that 1.25m families received over £1bn in overpayments in 2006-7, meaning that in just four years the money lost through fraud, error and overpayments would amount to over £10bn. "The expected loss of £10bn in four years lays bare the failings of this system that is clearly not delivering the financial stability low-income families need. "Gordon Brown likes to boast about the tax credit system, but the reality is very different to the spin. "The figures will serve to remind families of the huge problems Gordon Brown’s pet project has faced in the five years it has been running. Despite changes to the Tax Credits system which were announced by ministers with great fanfare, overpayments are still expected to be over £1bn for last year alone. "Far too many low-income families are still being put on a financial rollercoaster by the enormous complexity of a system that too often gives with one hand and takes away with the other. "The system must be stabilised by fixing awards on a six monthly basis to eradicate overpayments and win back the confidence of hard-working and overstretched families." Is the government waiting for a day on which to bury bad news? "David Cameron’s vision for the UK economy is just an empty shell. "The Conservatives’ attempts to make a virtue of having no policies will not convince anyone. "You cannot simply claim you will make Government more efficient and improve public services without offering any concrete solutions for how you will do it. "In reality, to reduce taxes and make government more efficient, tough choices about all areas of government spending must be made. "David Cameron insists on talking about sharing the proceeds of growth, despite the fact that all experts expect growth to fall. What exactly is he planning to share? "This hotchpotch of vacuous platitudes merely confirms how hopelessly ill-prepared the Conservative party is for power." Last week, Hazel Blears made a nod towards localism, by outlining plans to give people the right to trigger action on local issues. "This is a real example of ‘do as I say not do as I do’ from the Government. There is nothing here to suggest that we will cease to be the most centralised state in Europe. "Many councils are already forging ahead in empowering communities and today’s proposals are not new ideas. "Liberal Democrat councils in Birmingham and Eastleigh already hand over budgets and decisions to local areas. Liberal Democrat councillors in Kingston introduced a right to petition some time ago. "If ministers want to have any credibility in community empowerment they need to stop centralisation and hand control of decisions and finance back to local areas." "We now have a benefits system so complex that even Government officials can’t understand it. It is absolutely unacceptable that the amount wasted because of official error has risen in the past year to £560m. "Ministers have spent £3.9m since 2001 on campaigns to tackle benefit fraud, but yet again we see that the system is being exploited at massive cost to taxpayers. "The targets to reduce fraud and error have been missed by a mile, yet ministers still insist there is nothing wrong with the benefits system. "The Government must take radical action to tackle this problem: we cannot continue to lose almost £2bn a year for all the same reasons. There can be no more excuses." "Finally the Government has realised that their first time buyer schemes have helped too few families into homeownership. But where is the support for those facing repossession and homelessness? "The Government must now consider how struggling homeowners could be helped into shared ownership schemes to prevent repossession. "Unfortunately at the moment homelessness and hopelessness is where we seem to be heading." The Government has been forced to make a u-turn on new immigration rules because of pressure from the Liberal Democrats. The original rules would have banned people who made even an honest mistake in their applications from reapplying for a visa for up to 10 years. Even families and those who were under 18 when making the application would have been affected. However, after the Liberal Democrats forced a debate on the issue, Immigration Minister Liam Byrne conceded that the automatic penalty would be waived in the case of families and those under 18 when the error was made. "These changes were rushed through in haste and repented at leisure. "The absurd rules would have meant penalties for children who had been kidnapped by child traffickers, and would have ignored family circumstances by depriving children of a parent. "The minister has promised to reintroduce some aspects of discretion in key areas where automatic penalties would have been ridiculous." “There is an obvious inequality between the protection given to people who save with high street banks and those who put their money into schemes such as Farepak. “If any wrongdoing can be proved, ministers must ensure that those responsible are brought to book. It is estimated that 12,000 people in Wales lost their savings in the Farepak failure. All right, it's just for fun, as Peter Snow would say, but cast an eye on the unofficial poll on the Crewe blog site. There is hardly anything to choose between Conservative, Labour, Liberal Democrat and UKIP candidates. There are indeed whispers coming back from Crewe that Labour could finish third behind the LibDem and Conservatives. “The Government’s strategy for protecting citizens’ personal information is a shambles. “We’ve had mislaid CDs, lost laptops and now passwords are being circulated with the information they are supposed to protect. Peter Black has welcomed a government commitment to improve youth services - but warned that the new guidance may not be enough. Peter's attempt to use the Assembly's legislative powers to improve youth services were voted down by the Labour/Plaid government. But children ' s Minister Jane Hutt has pledged to toughen up guidance to local authorities to achieve the same aim. She said the new guidance would be issued "as a result" of Peter Black's work. Peter said: "I am delighted that the Minister has expressed her support for the principle of this Measure. "From talking to her, I understand that the Government fully approves of what I am trying to achieve - greater opportunities for young people in their communities. "I still believe that in order to secure the kind of services we have been talking about today, we need to pursue the matter through a Measure. I do not share the Minister's optimistic view that the same can be achieved through revising existing guidance. "Guidance, by nature, is not enough. We have had guidance in place through the 'Extended Entitlement' document, and I believe it has not proved effective. The evidence for that is there for all to see in our local communities. "The Minister has promised to bring this back within a year. I hope she is right that stronger guidance will make a difference. I am prepared to work with her to try to ensure that this is the case, if that is possible. "But my fear is that it will not and by then we will have failed a generation of young people by the time we are able to bring this back." This was the import of a Radio Wales news bulletin this morning. Welsh Liberal Democrats emerged from the 1st May elections, and the resulting negotiations, as the major power in Welsh local government. It appears also that there is a possibility that Labour will no longer control the Welsh Local Government Association. At this moment, a new law to create new opportunities for young people will be proposed by local Welsh Liberal Democrat AM Peter Black in the Assembly. Peter won the ballot to introduce private members’ legislation, is putting forward the proposed measure for debate today. If he has been successful, Peter will have six months to work on his outline proposal and bring forward a detailed draft measure. Peter says: “Talk to young people and they will tell you that there are very few things for teenagers to do or places to go. They want more after school facilities, music facilities and drama groups, youth clubs, better leisure facilities and many more. Where we do not have that provision we are failing young people and we are failing the communities in which they live. “One of the best examples of the sort of provision I want to see across Wales is the KPC Youth Centre in Pyle, in Bridgend,” he says. “The facility could act as an exemplar of good practice to local authorities up and down the country – yet KPC Youth is not operated by the council, but is run on a completely voluntary basis. “The facility was started up by Helena Parobij after her 18-year old son died of a drug overdose. Her vision was for a youth centre that would provide an opportunity for young people to escape the kind of boredom that might cause anti-social behaviour, petty crime or drug use. He acknowledges there is work to be done to make his proposals – which would put a statutory responsibility on local authorities to provide youth services - viable in all parts of the nation. Peter has already had informal meetings with the WLGA and the Children’s Commissioner who have given their support to the principles behind the measure. · Jenny Randerson’s healthier school meals measure – the first ever put forward by a non-government AM – will start to be scrutinised in detail by a committee AMs from this week. · Mike German’s proposal to improve consultation over school closures was thrown out by the Labour-Plaid government before it could be developed in to a draft measure. Cllr Keith Davies has questioned the decision by Neath Port Talbot CBC to split the May 1st election count over ten centres. Not only were costs incurred in lighting halls unnecessarily, but several successful candidates complained about failure of management and consequent delays at some of the smaller centres, as the ERO's staff was split and expertise diluted. One might also add the cost of the co-ordinating centre in Port Talbot civic centre, which was intended to serve the media, but which seems to have been largely by-passed. Ioan Richards informs us that LibDem-led Swansea City will tomorrow offer the Labour opposition the chairs of each of the council's four scrutiny committees. That makes more apposite the call by two leading Neath Port Talbot councillors for greater responsibility for opposition members when the composition of committees is calculated later this month. Martyn Peters and Keith Davies point to the fact that Labour was elected on a minority of the popular vote. Perhaps this will sway the incoming council leader in his proposals, but since it cut no ice with either Margaret Thatcher or Tony Blair on the national stage, one should not hope for too much. The outgoing leader, Cllr Derek Vaughan, has countered with the same conspiracy theory with which he contested the elections: "they denied residents the democratic right to vote for the political party of their choice by agreeing which candidates should stand where". Our standpoint is somewhat different. There were three wards in which, if there had not been a Liberal Democrat candidate, a councillor would have been returned unopposed. Now that would have been the denial of a democratic right. And if Cllr Vaughan was so intent on providing a right for everyone to vote in a Labour councillor, why did his party not provide an opponent to Keith Davies in Coedffranc North? “The number of families threatened with repossessions is on course to be the highest since 1991, at the height of the Tory recession. “Repossession claims have skyrocketed since last year. Many families could well end up losing their homes in the months ahead. “The Prime Minister’s pride and stubbornness has made him completely unwilling to recognise the dangers in the housing market. It is overstretched households that will pay the price. “This Government must stop having vague discussions with mortgage lenders and instead clearly lay out the procedures which must be followed before a property can be repossessed. 1991, when the total was 186,649. English South West MEP Graham Watson has reacted in fury to news that the Treasury will keep £79 Million of the £110 Million granted by the EU's Solidarity Fund to help with the clean-up from last year's floods. "For the Treasury to deny the Department of Communities and Local Government over two-thirds of the EU flood solidarity money is thinly disguised theft. It also shows the absurdity of the so-called "rebate" negotiated by Mrs. Thatcher, which has always enriched the Chancellor at the expense of ordinary citizens". It seems that not only in the Third World does aid intended to alleviate suffering of ordinary people finish in government pockets. “This Government simply doesn’t understand how to cut carbon emissions or control costs. “The report shows that basic steps are not being taken to reduce the need to travel. The taxpayer and the environment are paying the price for the Government’s extravagance. - There is a clear problem with government departments not recording travel adequately, with only four departments able to provide details on the number and cost of flights taken to overseas destinations in response to parliamentary questions. Parliamentary Answers to the Liberal Democrats show that out of the 18 ministries questioned, only two had set targets for the use of video conferencing to reduce departmental travel. The Government last week announced that £1.5m is to be spent on lie detector tests designed to stop benefit fraud, despite the fact that results of the pilot schemes have not been published. “Before spending another £1.5m on more lie detector pilots, ministers should publish the evidence to show it does lower benefit fraud and is not another money wasting scheme. “Spending more taxpayers’ money must be justified with proof that lie detector technology is actually making a real difference. David Cameron has apparently promised to make the abolition of the 10p tax rate the key focus of the Conservative Crewe by-election campaign. No doubt Elizabeth Shenton, our candidate there, will lose no opportunity to point out that Conservatives voted in favour of the measure in 2007, when Liberal Democrats voted against. Vince Cable's view is that: “David Cameron is involved in the worst kind of political posturing. “He cries crocodile tears for those who are losing out from the abolition of the 10p tax rate, but the only tax cuts he has proposed are for millionaires. “If he wants to do anything meaningful to help these people, he must put forward fully costed proposals on how he would make those on low incomes better off. “The Government really should have seen this coming. Asking the Royal Mail to compete on the open market, without first making sure it had the resources to do so, was always bound to compromise the company. “They have allowed this great British business to fall apart at the seams. Royal Mail can be turned around, but only if it is given the freedom to innovate and attract new customers. “Successive Conservative and Labour Governments have starved Royal Mail of investment. Royal Mail urgently needs a cash injection to allow it to modernise and compete with the private sector. Selling 49% of the Royal Mail shares would allow major investment without breaking the public purse. Liberal Democrat MEP Graham Watson is supporting calls for the introduction of an EU missing alert system for children who are suspected of being abducted. "A Europe wide scheme equivalent to the US 'Amber Alert' system would undoubtedly save lives," he says. "The European Parliament's initiative on this is a good example of where a Europe wide-action could really add something. Increased cross border cooperation is essential in these cases." Graham Watson supports calls for a system which will immediately supply to relevant news media, border authorities, custom and law enforcement agencies, details of: the missing child, with a photograph if available; information relevant to the disappearance and/or the suspected abductor(s); and a telephone number to call with information. “Biofuels must not damage the environment they are meant to protect. “The early rush towards biofuels failed to take into account their wider environmental impact and the Government’s current policy is far too crude and simplistic to change this. “European targets must not incentivise the production of unsustainable biofuels and the Government must act now to prevent this from happening. There is also a welcome, albeit slight, correction to the gender ratio, with Linet Purcell, Rosalyn Davies and Marcia Spooner (all Plaid) and Andrea Davies (Labour) taking over from men. We'll leave it to the genuine political anoraks to dig out the figures and publish the %age swings in the vote! “The Government is in a hole of its own making. “Ministers acted shamefully by scapegoating overseas doctors last year for the mess they made with the junior doctor training process. Health may be a devolved matter, but immigration policy is not. Labour have called the Crewe and Nantwich by-election for May 22nd, just three weeks from today.